Head back to the 1950's playing the drive in themed 5 Reel Drive online slots game. There are 5 reels in the game, which is simple to play and the minimum wager per spin is 10 cents and because of this, 5 Reel Drive will appeal to low stakes players ad well as high rollers. The maximum coin payout in the game is 10,000 coins. You can test this game here with no download required. There is not a multiplier, no bonus games, and no free spins to be won, but there is a wild symbol and a scatter symbol. 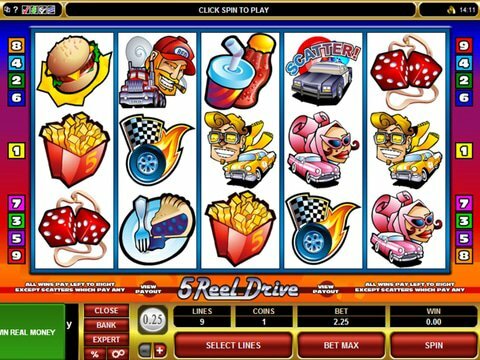 Just a few of the colorful symbols you will see in 5 Reel Drive online slots include some fuzzy dice, a hamburger, soda, coffee, French fries, and a pie. The road sign symbol with the word Wild is obviously the wild, which replaces any symbol except the scatter symbol to create a winning combination. The scatter symbol is the police car and the scatter wins will be added to the payline win and the more you spin the more you win. When spinning the reels, you'll find that the Wild symbol is a yellow road sign indicating a winding road ahead. It can substitute for any symbol except the Scatter to compete any activated pay line, but it's not a multiplier. Microgaming powers this free slot and like all of their other games the sounds and graphics are fantastic. To win the top jackpot you have to click on the Bet Max button, which is located with all the other betting control buttons at the bottom of the attractive interface. To the left of the betting control buttons you will see your current game balance and if you want to check out this exciting game head to Jackpot City Casino. This site is our most highly recommended casinos where you can receive an exclusive no deposit bonus of $10.